The first ROV exploration of the Perth Canyon offshore southwest Australia discovered diverse hot spots of deep-sea biota to depths of ~ 2000 m. Some corals were living below the carbonate saturation horizon. Extensive coral graveyards found at ~ 700 and ~ 1700 m are between ~ 18 000 and ~ 30 000 years old, indicating these corals flourished during the last ice age. Anthropogenic carbon detected within the upper ~ 800 m highlights the increasing threat of climate change to deep-sea ecosystems. This study looks at how foraminifera interact with their geochemical environment in the seabed. We focus on the incorporation of the trace metal manganese (Mn), with the aim of developing a tool to reconstruct past pore water profiles. 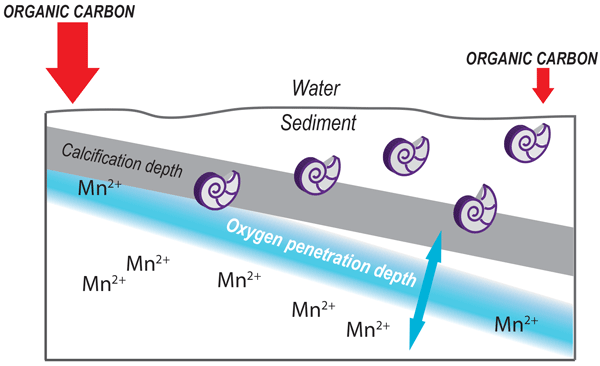 Manganese concentrations in foraminifera are investigated relative to their ecological preferences and geochemical environment. This study demonstrates that Mn in foraminiferal tests is a promising tool to reconstruct oxygen conditions in the seabed. We document 2.5 yr of dinoflagellate cyst production in the Cariaco Basin using a sediment trap record. Each species' production pattern is interpreted in the context of the physico-chemical (e.g., temperature, nutrients) and biological (other planktonic groups) environment. 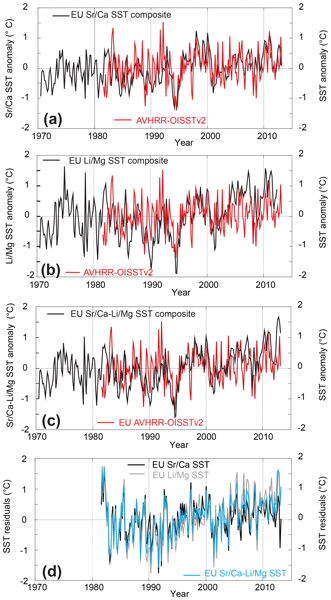 Most species respond positively to upwelling, but seem to be negatively impacted by an El Niño event with a 1-year lag. 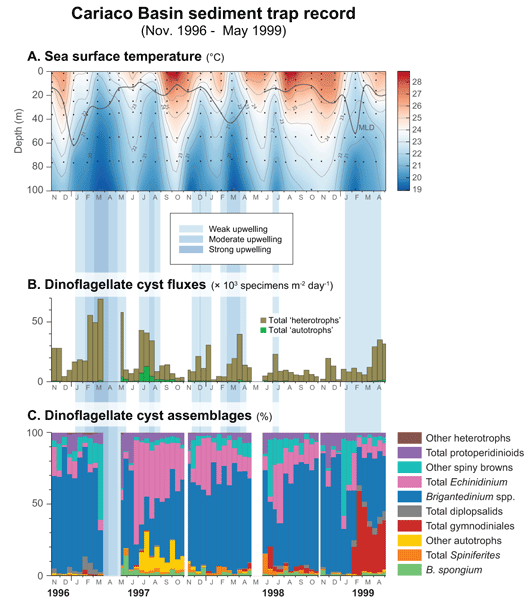 This work helps understanding dinoflagellate ecology and interpreting fossil assemblages in sediments. Algal-derived compounds allow us to make assumptions about environmental conditions in the past. In order to better understand how organisms record environmental conditions, we grew microscopic marine algae at different light intensities, salinities, and alkalinities in a temperature-controlled environment. We determined how these environmental parameters affected specific algal-derived compounds, especially their relative deuterium content, which seems to be mainly affected by salinity. Here we report Mn / Ca ratios in living benthic foraminifera from the NE Japan margin. The results show that the Mn incorporation directly reflects the environment where the foraminifera calcify. Foraminifera that live deeper in sediment, under greater redox stress, generally incorporate more Mn into their carbonate skeletons. As such, foraminifera living close to the Mn reduction zone in sediment appear promising tools for paleoceanographic reconstructions of sedimentary redox conditions. 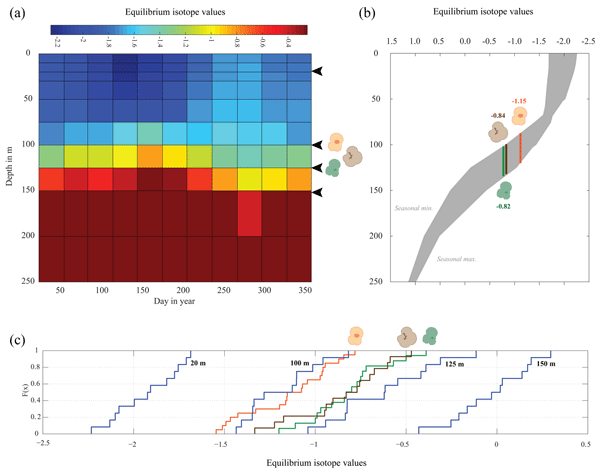 Planktonic foraminifera species depth habitat remains poorly constrained and the existing conceptual models are not sufficiently tested by observational data. Here we present a synthesis of living planktonic foraminifera abundance data in the subtropical eastern North Atlantic from vertical plankton tows. We also test potential environmental factors influencing the species depth habitat and investigate yearly or lunar migration cycles. These findings may impact paleoceanographic studies. Enhanced analytical techniques were applied to characterize fossilized microbial cell membrane lipids from samples in the Tagus River basin spanning the last 6000 years. Using the novel methods and calibration, the pH estimates were improved upon, and this study reveals new factors that should be considered when using this proxy as well as affirms the importance of examining the provenance of these lipids before applying them for paleoclimate reconstructions. Our study demonstrates that rare earth elements and yttrium (REY) accumulating in mussel shells emerge as potential proxies for environmental changes. 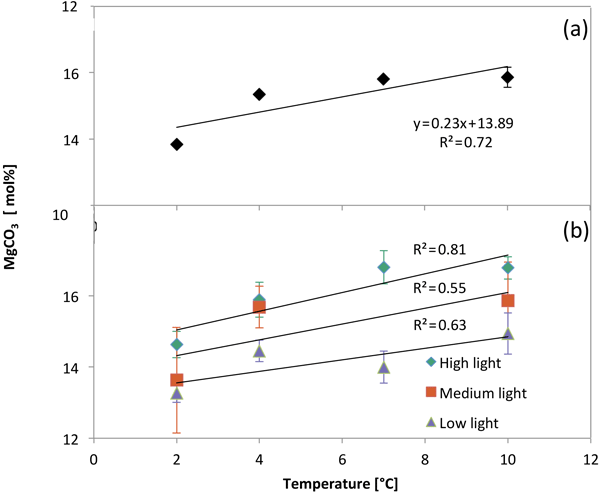 Focusing on pH and temperature variation effects on the distribution of REY in seawater, we show that shells incorporate the free REY3+ species and that decreasing pH leads to increased REY concentrations, while rising temperatures impact the REY distribution pattern with minor effects on the absolute REY concentrations in shells. The paper presents the results of a fossil invertebrates study in four caves of the Romanian Carpathians, to complement paleoenvironmental data previously reported. Oribatid mites and ostracods are the most common invertebrates in the studied cave sediments. By corroborating the fossil invertebrates' record with the information given by magnetic properties and sediment structures, complementary data on past vegetation, temperatures, and hydraulic regimes could be gathered. 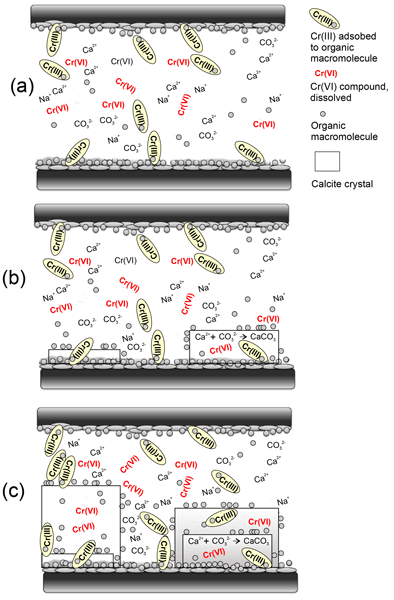 We present an innovative method using osmotic pumps and the fluorescent marker calcein to help identify where and when calcareous bottom-dwelling organisms mineralize in sediments. These organisms, and their geochemical signatures in their carbonate, are the ocean’s storytellers helping us understand past marine conditions. For many species, the timing and location of their calcite growth is not known. Knowing this will enable us to reconstruct past marine environments with greater accuracy. We highlight the proxy potential of foraminiferal Mn/Ca determined by secondary ion mass spectrometry and flow-through inductively coupled plasma optical emission spectroscopy for recording changes in bottom-water oxygen conditions. Comparisons with Mn sediment bulk measurements from the same sediment core largely agree with the results. High foraminiferal Mn/Ca occurs in samples from times of high productivity export and corresponds with the benthic foraminiferal faunal composition. Culture experiments based on a decoupled pH and CO32- chemistry indicate that the δ11B of the test of A. lessonii is related to pH whereas the B/Ca of the foraminiferal shells show a positive correlation with B(OH)4-/HCO3-. The latter observation suggests a competition between B(OH)4- and HCO3- of the culture media for B uptake into the test. Fossil planktic foraminifera and their geochemical composition are commonly used proxies in palaeoceanography. Our study with living specimens revealed that in the Fram Strait both Neogloboquadrina pachyderma and Turborotalita quinqueloba from the water column have lower δ18O and δ13C values than inorganically precipitated calcite/fossil tests from the sediment surface. These offsets indicate biological influence during calcification and a change of water column properties in the recent past. Planktonic foraminifera are an important component of the marine carbon/carbonate cycle, yet the environmental controls on their abundances are still debated. In our study, we see larger foraminifera fluxes, particularly of heavy species, during winter when nutrients are mixed into the surface waters or during eddy mixing. 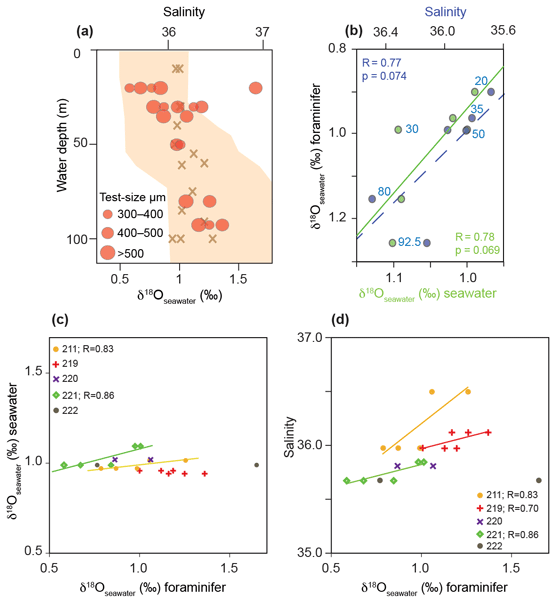 Climatic factors that control mixing could therefore control the flux of planktonic foraminfera and the carbon/carbonate flux on seasonal and decadal timescales. Our study explores the correlation of I/Ca ratios in four benthic foraminiferal species (three calcitic, one aragonitic) from the Peruvian OMZ with bottom water oxygenation ([O2]BW), and evaluates foraminiferal I/Ca ratios as a possible redox proxy. All species have a positive trend in the I/Ca ratios as a function of [O2]BW. Only for the aragonitic species Hoeglundina elegans is this trend not significant. The highest significance has been found for Uvigerina striata. The relationships between environmental variables and the cyclization of branched tetraethers (CBT) were investigated in surface soils in the Chinese Loess Plateau (CLP) and its vicinity. We find that CBT is not sensitive to soil pH but correlates best with soil moisture in these alkaline soils from arid-subhumid regions. Therefore, we suggest that CBT can potentially be used as a palaeorainfall proxy on the CLP and applied it to three loess-paleosol sequences published before.